YOMG is all about seasonal goodness because there’s nothing quite like the taste of perfectly picked fruit. So, we’re welcoming Autumn with a fresh batch of tasty toppings that, like all things YOMG, are packed with natural goodness. A seminal Autumnal fruit, the delicious apricot is delicately sweet and a teeny bit tart. Our apricot has been stewed with organic vanilla bean to accentuate its rich, warm flavours, which really are what Autumn is all about. Meaning ‘Good Stomach’ in Maori, this special blend of seeds is great for your insides. Packed full of protein, energy and amino acids, sprinkle Kapai Puku on your next Fro Yo for all the energy you need to get through the day. Our raw honey is exactly as Mother Nature intended. Totally unprocessed, unpasteurised and cold stored, our raw honey contains many naturally occurring enzymes that offer exceptional nutritional value and are easier to digest. The sweet and aromatic cantaloupe is well loved, not just for its delicious taste, but also its low calorie content and nutritional benefits. The humble cantaloupe is a great source of Vitamin A, Vitamin C, beta-carotene. These little bursts of juicy goodness are both healthy and delicious. Actually classified as a berry, grapes are considered the queen of fruits as they store heaps of nutrients, such as poly-phenolic antioxidants, vitamins, and minerals. 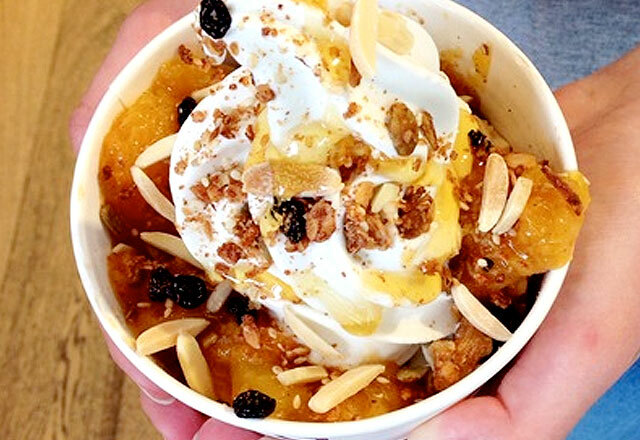 All of these new toppings taste their absolute best served a top YOMG Original Tart frozen yogurt. Made in store daily, YOMG’s Original Tart yogurt is made from Greek-style yogurt, sweetened with the natural goodness of Stevia. Absolutely no added sugar! So step to it and embrace the change of seasons at local YOMG store today!